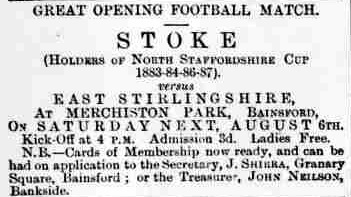 I just came across an "article" about East Stirlingshire's [indeed any club from Stirlingshire's] first venture into foreign climes; when they journeyed south to Stoke-on-Trent to play a return friendly against Stoke on Monday the 2nd of January 1888, as Stoke had opened Merchiston Park at the begining of the Season. I have no idea who penned this article as he wrote it under the pseudonym "O.P.Que", but he has a very strange turn of phrase, and sometimes I have no idea what he is on about. "Having accepted the kind invitation of the Stoke-on-Trent F.C. to return the visit paid to us in August last, we left Bainsford on Sunday night at 4:45 in a break bound for Larbert Station, where we were to join the Limited Mail, which was to convey us to the pottery town. There were sixteen of us all told, and we sported own native heather, each one seemingly determined to show that he was a "Scottie". At Larbert we entered into possession of a handsome saloon, which was kindly placed at our disposal by the local agent of the Caledonian Railway Company, and we were started on our long journey amidst shouts of encouragement from a large party of our friends who had gone over to see us off. The first part of the journey was passed very pleasantly, a due regard for Sunday observance being strictly enforced by the evil-doer having to run the risk of getting his head smashed with a boot or a bag, and sacred music only being allowed, although, I must admit, we were not too plentifully supplied with it. One member of the party who had been fortifying himself for the journey, proved himself a friend in need, his funniosities keeping the party in the best of spirits, while variety was added by an occasional fight for possession of the good things which a kind friend had thoughtfully provided, and in these engagements the redoubtable Pullar bore a prominent part , but despite his military training, he had very much the worst of the battles. Carlisle was reached about nine o'clock, and having a short time to wait there, an adjournment was made to the refreshment bar for hot tea or coffee, and in a very few minutes the tables were considerably lightened. At 12 o'clock cards and secular music was added to the programme, and an attack was made on the sandwiches, which this time proved more successful. The mirth and fun grew fast and furious, and when Crewe was reached at 12:40, we were in the midst of a jolly rumpus. At Crewe we were to leave the main line and join that of the North Staffordshire Coy., and having an hour to wait on the connecting train, we indulged in a visit to the refreshment saloon, from which we were expelled after a brief stay. At 1:30 we were surprised to learn that we could not leave Crewe until 7 o'clock, and all attempts to mend this state of matters ended in smoke, we proceeded to make ourselves as comfortable as possible, and also to make plenty of noise. Sleep was impossible, and those who did drop into the arms of Morpheus awaking to find themselves transformed into burnt cork *******. All kinds of amusements were tried, but that six hours' wait at Crewe did not add to our enjoyment, and we dropped a big sigh of relief when the time for our departure arrived. Stoke was reached at 8:10 A.M., and although we had a most enjoyable ride, 15 hours in a railway carriage did not promise well for our men in the field. Immediately on arriving at Stoke, "tracks" were made for the Copeland Arms Hotel, where apartments had been engaged for the team. After a good wash we felt considerably freshened up after our long journey, and we were in rare form for breakfast, which was served in sumptuous style. On its completion our luggage was stowed away in the different rooms destined to be our homes during our stay. That finished, a stroll round the town was indulged in, and a very curious town it looked too. Everything appeared to be brick, houses and streets alike- in fact, one church and the police station were the only stone houses seen. The fronts of some of the houses were finished off with different coloured bricks, which gave them a very artistic appearance. But when we remembered we were in the centre of the potteries, this great display of bricks was not to be wondered at, although they did look a little curious when put in contrast to the stone houses at home. "When all was seen that could be seen" during our stroll, an adjournment was made to "Minton's" Pottery, which is said to be the largest and finest of its kind in the world. Mr Lockett, the courteous secy. of the Stoke club, had previously made arrangements for our reception there, and accordingly we were very courteously received at the entrance of tyhe works by the manager, who forthwith proceeded to let us into the mysteries of the potter's art. Proceeding from the gate, we first visited the clay room, where loads upon loads of white clay were stored, which at no very distant time would be formed into every kind of delf known, both useful and ornamental. Proceeding from the clay room, we next entered the handle room, where a lot of boys were engaged making handles for the almost endless variety of dishes which "Minton's" firm turn out. The manufacturers of the handles awakened the liveliest interest amongst our fellows, but as we passed from room to room and saw the beautiful vases, statues, and other costly ware being made by the employees, our interest knew no bounds, and each and all declared that they had never seen anything like it in their lives. But the greatest treat was reserved till near the finish, when on opening a door on the second floor our courteous guide introduced us to the artist's room, that is where the figures and engravings are put on the crockery, and where the hand painting is done. Young girls and old women, young lads and old men were employed here, and the way they executed the beautiful and difficult designs was a treat to be remembered a life-time. The workers, I may mention, were very obliging in explaining the manner in which their work was done, and were not a bit afraid to put themselves to a little inconvenience to thoroughly explain anything not perfectly understood by the company. As a grand final we were introduced to the show-room, where the finished were shown off to advantage. This room is a very large and splendidly lighted , and the manner in which the different articles were grouped together was simply magnificent. However, as the time for our match was drawing near, we had to reluctantly turn our steps towards the gate, and after heartily thanking our guide for his great kindness, we proceeded towards the "Copeland Arms," and in a few minutes after our arrival there preparations were made for the battle. "Pullar" soon had his men ready, and we forthwith proceeded to the scene of the encounter, where we were met by an enthusiastic crowd numbering over 1500. The ground is a splendid one, and of great size, very level, with a four-laps-to-the-mile cinder track round it. Owing to the recent frost and sudden thaw, the surface was in a very bad state, and it was next to impossible to keep one's footing. The stand is without doubt the finest in England - or Scotland either, for that part. It is built of brick, and covered, so that you feel more like in a theatre than a football field. Shortly after our appearance on the field, rain began to fall, which made matters worse for players and spectators alike. But to the match! Stoke lost the toss, and kicked off a few minutes after the advertised time. The Scotchmen were first to invade, and missed a chance of scoring through the slippery state of the ground. After a visit to the other end, Stoke were again compelled to retire, and twice Rowley saved his charge. Ballham broke away, and Stoke threatened, but the ball went behind. Stoke assailed again, and Sharp, the Scotch custodian, handled twice. A run down by the visitors was then succesful, a shot by Kirkwood beating Rowley, and scoring the first point for East Stirlingshire after ten minutes' play. The locals attacked, but the defence of Mitchell and Wilson remained intact, and a fine passing run was displayed by the visitors carrying the play to the opposite end. Again Stoke went to the front, and Ballham made a grand shot, whilst Brunt rushed up to the goalkeeper and converted the attempt into a goal, equalising the score after twenty minutes' play. Stoke pressed again but Sharp saved, and next the visitors scored again from the foot of Dunn. Stoke were once more the assailants, but their opponents, with a splendid bit of passing, took the leather the length of the ground and Dunn scored a third point. Resuming, both goals were visited, and both goal-keepers preserved their charges intact, the ball alternately from end to end. Owen made a shot which just missed its mark, and immediately the opposing forwards also shot behind. The game was evenly contested during the first half, at the end of which time the game stood: East Stirlingshire 3; Stoke 1. In the second half E.S. showed signs of fatigue, but their splendid combination at times evoked a hearty cheer from the onlookers. However, Stoke put on 6 goals in this half, and won by 7 goals to 3. E.S. were without Doyle, for whom Mitchell played, and Johnston was also absent, his place being taken by Reid. To crown all, Stewart turned sick during the game. Our fellows don't understand the off-side rule as they do in England, as that was the great drawback in the second half. Two goals were disallowed owing to this, and Dunn hardly touched the ball, but the gentleman from Leek blew his whistle. After the match we proceeded to the hotel and dressed for dinner, which had been provided on a magnificent scale by the Stoke club. We have been at many a splendid feed after a match, but the one we had here put everything previously in the shade. Mr Thomson, the vice-president of the Stoke club, occupied the chair. The E.S. team remained in Stoke until 11 p.m. on Tuesday night, arriving home on Wednesday morning. From the Falkirk Herald Saturday 13th August 1887. The East Stirlingshire opened their season at Merchiston Park, Bainsford, on Saturday by a match with Stoke-on-Trent, the holders of the Staffordshire Cup. The weather was most unfavourable , rain having fallen heavily for several hours prior to the game commencing, and continuing throughout the whole of the play. This had a very telling effect on the attendance of spectators, and the numbers present would not exceed 1000. The visitors won the toss, and elected to defend the west goal, and McLauchlan kicked off, and from a miss from Reid the visitors got the leather at once well into the home territory, but Wilson and Doyle at back played a fine defence, and the goal was well cleared, and the ball taken into mid-field, where play remained for a time. Play had gone on for about twenty minutes , when Dunn, from a smart pass by McLauchlan, headed the leather between the uprights, and thus registered the first goal for East Stirlingshire. For about a quarter of an hour East Stirlingshire kept up a most determined attack on the Stoke goal, shot after shot being sent in in rapid succession, but they were as smartly saved by Rowley. A minute from the call of half-time the home team relaxed their pressure, and Bollom, getting away with the leather, ran it right up the field. He made a straight shot for goal, but the leather striking Sharp, the ball rebounded, and on Sharp running out to lift it he slipped, owing to the soft condition of the ground, and Bollom, who had followed it up, touched the leather, and it rolled through between the posts. Half-time was then called, leaving the score at one goal each. In the second half a lot of hard work was put in by both teams, and, when the game had gone about half an hour, McLauchlan scored a second goal for East Stirlingshire. The visitors tried hard to equalise, but were unable to do so, and time was called, leaving the result - East Stirlingshire, two goals; Stoke, one. Teams:- Stoke - Goal, Rowley: backs, H.Montford and T.Clave; half backs, E.Smith, G.Shott (Captain) and W.Holford; forwards, right wing, A.Edge and J.Sayer; centre, L.Bollom; left wing, T.Wainwright and J.Owen. East Stirlingshire - Goal, Sharp; backs, Wilson and Doyle; half backs, Inch, Kadie and Johnstone; forwards, right wing, Stewart and Reid; centre, McLauchlan; left wing, Dunn and Honeyman.